SANTA CLARA, Calif., Nov. 13, 2018 /PRNewswire/ — ioTium, the first commercially deployed Software-Defined Converged Infrastructure company for the Industrial Internet of Things (IIoT), today announced that the Company has joined Siemens’ MindSphere Partner Program as a Gold Partner. The MindSphere Partner Program is Siemens’ partner program for Industrial IoT (Internet of Things) solution and technology providers. As a Gold Partner, ioTium can work to accelerate the adoption of Industry 4.0 in industrial enterprises leveraging MindSphere. ioTium’s vision for Software-Defined Converged Infrastructure solutions for IIoT is based on the learning that both flexibility and simplicity are equally important in approaching Industry 4.0. Organizations must combine elements of security, network, and edge computing in a multi-tenanted, scalable and open way to realize their deployment. MindSphere is the cloud-based, open IoT operating system from Siemens that connects products, plants, systems and machines, enabling businesses to harness the wealth of data generated by the IoT with advanced analytics. The ioTium Software-Defined Converged Infrastructure solution for IIoT is the fabric that connects legacy brownfield industrial assets to MindSphere. ioTium solutions are designed to enable industrial enterprises to rapidly and reliably move data from brownfield industrial assets to the cloud without the need for costly additional IT staff. Joint ioTium and MindSphere customers may also gain rapid return on investment from predictive analytics, preventative maintenance and machine learning. As a MindSphere Gold Partner, ioTium has technical staff trained by Siemens through the MindSphere technical curriculum, multiple MindSphere applications under development and a joint go-to-market agreement to assist customers in achieving substantial business value through IoT and MindSphere. cohesionIB, a cloud-based intelligent building software platform has selected ioTium, the first commercially deployed Software-Defined Converged Infrastructure company for the Industrial Internet of Things (IIoT). Together, the companies will leverage their shared expertise in building automation to bring greater intelligence to commercial real estate properties worldwide. ioTium and cohesionIB will showcase their joint work at this week’s Realcomm CIO Forum. The event, sponsored by ioTium, will be held at 151 North Franklin in Chicago – a much celebrated commercial real estate property developed by The John Buck Company. During the event, cohesionIB and ioTium will showcase the benefits of 24/7 secure remote access and a mobile interface to interact with all of the amenities and features of the building. Both companies have a shared understanding of the fact that while there are many “smart” components to modern buildings, most do not fully embrace the promise of the IIoT. While systems have the ability to communicate, they are frequently siloed and unable to connect in a way that will allow each building to respond to or anticipate changes. The result is a mix of systems difficult for the small IT teams, common to commercial properties, to manage. Whether it’s designing a new building in a highly competitive commercial real estate market or updating a half-century old property for the needs of modern tenants, cohesionIB and ioTium offer a unique joint solution to commercial property owners and operators. System updates can be made within minutes and new access and permissions can be granted in seconds. A unified dashboard allows small IT teams to keep a close eye on each building – or a number of buildings from a distance. The CIO RealComm Forum will be held October 18, 2018 at 151 North Franklin in Chicago. The invitation-only Forum is open to CIOs and other senior IT professionals in the commercial real estate development and related service industries. SANTA CLARA, Calif., Sept. 27, 2018 /PRNewswire-PRWeb/ — ioTium, the first commercially deployed Software-Defined Converged Infrastructure company for the Industrial Internet of Things (IIoT), will be at Emerson Exchange Americas in San Antonio October 1-5, 2018. 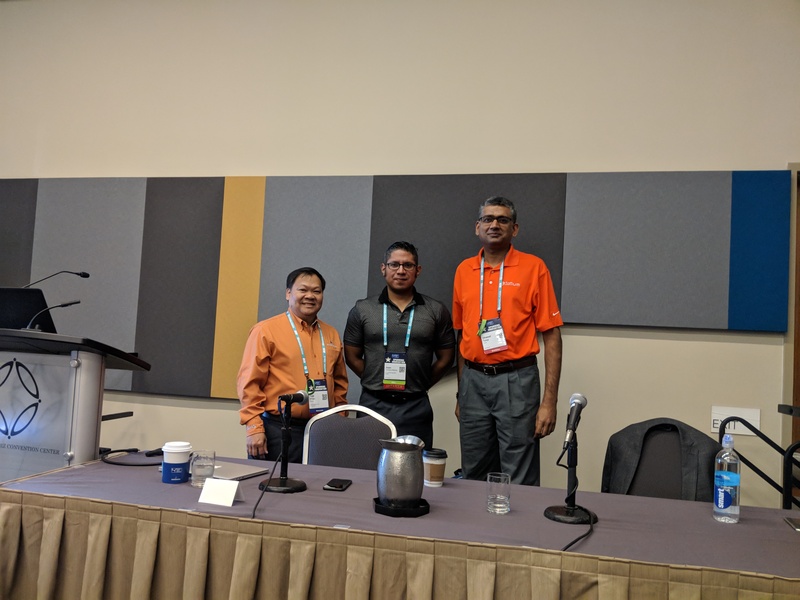 Dhawal Tyagi, ioTium co-founder and chief product officer (CPO), will co-lead a workshop on “The Definitive Guide to Networking Security for IIoT for Plantweb Optics and AMS Device View” alongside Emerson senior reliability consultant solution architect Tinh Phan. In the session, Tyagi and Phan will cover how industrial organizations can securely connect the legacy brown-field world with the new cloud-enabled world, for preventative maintenance. The invitation-only Emerson Exchange conference was developed to provide end users with a valuable exchange of information among process manufacturers, end-users and Emerson experts. All participants are nominated and carefully vetted by Emerson. The event features workshops and short courses, product roadmap presentations, technology roundtables, meet the expert sessions and technology exhibits. In addition, the program will include keynote speakers from Emerson. WHO: ioTium’s Co-founder and CPO, Dhawal Tyagi, will be attending the event and co-leading the workshop alongside Emerson’s Tinh Phan and Juan Campos-Ramos, technical assistant IV at the University of Texas JJ Pickle Separation Facility. Tyagi will also be available at the ioTium booth in the Emerson Exchange Exhibit Hall. WHAT: The joint ioTium and Emerson workshop, titled: “The Definitive Guide to Networking Security for IIoT for Plantweb Optics and AMS Device View,” will cover the use case of creating a data portal by transporting data from the industrial plant floor to business layer or into the Azure or Amazon Web Services Cloud. This workshop will address the security issues within the IoT network and allow participants to obtain a methodology that solves legacy, security and ease-of-deployment issues at their facilities. Emerson Exchange will take place from Monday, October 1 to Friday, October 5, 2018. The workshop will be held on Tuesday, October 2 from 9:00-9:45 a.m. CT and Wednesday, October 3from 1:30-2:15 p.m. CT.
WHERE: Emerson Exchange Americas 2018 is taking place at Henry B. Gonzalez Convention Center, located at 900 E. Market St, San Antonio, TX 78205.